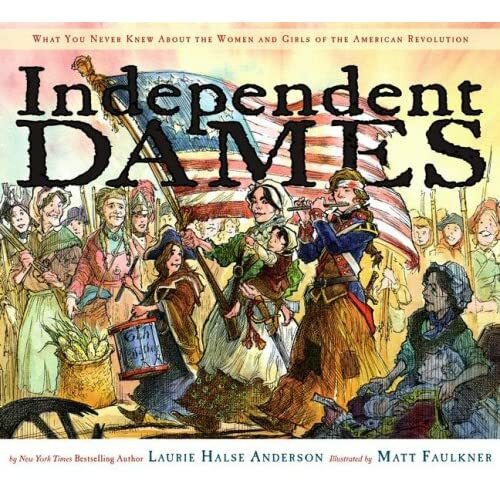 I don’t normally review picture books, but when I saw a preview of Independent Dames: What You Never Knew About the Women and Girls of the American Revolution by Laurie Halse Anderson, I knew I had to have it. Laurie Halse Anderson is one of my favorite writers, I love books that focus on women in history, and it looked like a great example of a multigenre book for me last unit of study. I was right on all counts! The only question is how to review this title. Independent Dames is a great example of a multi-genre picture book. The illustrations are done by Matt Faulkner (who also illustrated Thank You, Sarah: The Woman Who Saved Thanksgiving with Laurie Halse Anderson) and play a major part in the story. Independent Dames is not your typical picture book. Instead of one narrative thread through the pages, there are four types of writing on each spread- a timeline, biographical information, narrative storyline, and dialogue bubbles. My students are working on multigenre research projects right now and I can’t wait to share this with them so they can see how a topic, such as women in the Revolutionary War, can be shared through various genres. The story begins in the narrative box, with a narrator welcoming the reader to another school play. The slightly sarcastic tone informs the reader that while the play is fine and dandy, the students are missing about half the important people and half of the story. As the story continues, the narrator introduces the fact that women were heavily involved in the fight for freedom, even if history books tend to leave out their stories. The story of the Revolutionary War is then told across the pages of the book, in the slightly sarcastic, know-it-all voice of the narrator. I LOVED the voice in this book. Absolutely loved it. This is a picture book built for intermediate grades and middle schoolers, and the voice will speak to them. Middle schoolers are sarcastic, they are know-it-alls, and they certainly don’t want to be treated like babies. Too many non-fiction picture books talk down to students, dumbing down the information and making the topic dry and dull. Anderson makes the information accessible and dare I say, even fun! There are 89 women profiled throughout the book. Most of the women are featured in biographical sketches that explain their contribution to the war effort. While the wives of the Founding Fathers are featured, they play a small role compared to the other various women profiled. The women whom Anderson chose to feature constantly elicited exclamations from me as I read. For example, I had no idea that Sybil Ludington was 16 years old when she rose 40 miles through the night to spread the news of a British attack and round up militia members. Remember Paul Revere? He rode 16 miles. Total. Who knew?! The biographical sketches are all easy to read and do not burden the reader with unnecessary information. In my opinion, Anderson gives just enough information to interest the reader and hopefully convince them to research further on their own! Each page also includes dialogue boxes which add a little bit of humor to Faulkner’s illustrations. The dialogue boxes and illustrations continue to showcase the play that the story focuses on. I laughed out loud while reading many of them! Finally, the book ends with four pages that profile “Even More Dames”. Laurie Halse Anderson provides information on even more Revolutionary dames, while also debunking myths (Molly Pitcher). Anderson also focuses on women of all races and creeds- there are African-Americans, Oneida women, Loyalists, and Tories throughout the book. The books concludes with an author’s note, illustrator’s note, a bibliography, and an index of the famous dames. Every teacher’s dream! I can not wait to add this title to my classroom library. Laurie Halse Anderson has created the ultimate non-fiction book for middle-schoolers. I can’t wait to use it for my multi-genre study and my Women’s History Month project. Independent Dames: What You Never Knew About the Women and Girls of the American Revolution is an absolute MUST for all classrooms and libraries! And the best part is, students will actually want to read it! It can be read at a glance, with the narration and dialogue bubbles, or kids can read deeper and examine the crawl/timeline. This is a book that can be read over and over, with kids learning something new each time.